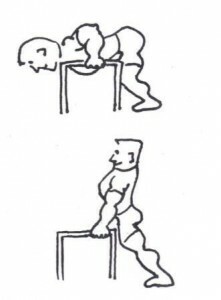 Here’s an illustration of the “Good Morning Dip” by John McKean, a student of Dr. Len Schwartz and advocate of “Longstrength” training for weight lifters. The “Good Morning” is another name for the “forward bend”… like that done when “touching your toes”. A “Dip” is a “pushup” or “press up” on two parallel bars that allow the body to be suspended in mid air and lowered, then raised. Most of us cannot do the “Dip” exercise aerobically! Even if we could, it would not mean Dr. Schwartz’ criteria of engaging multiple muscle groups at the same time to reduce the effort expended by any SINGLE group! So Dr. Schwartz combined these two exercises into one… so that it would activate the chest, shoulders, arms, and lower back with each of these muscle groups offering support so the movement could be done for a long time! The exercise is so are… nobody has made a video even! You could also use the backs of two sturdy chairs. Others use “walkers” that people who are not stable enough to walk use to get around! You could even use the surface of a washing machine or kitchen counter or other elevated surface. Adjusting the handles on a suspension trainer should work as well! Whatever you choose to work out with, bend forward while letting your arms guide you down while under control. Using your back and arms, come erect again. This exercise should allow your arms to do many more “pushups” (“press ups”) or “dips” than could otherwise be done because of the back involvement. At the same time, your lower back is getting the assistance of the arms. While this movement may not seem too taxing, done in sufficient number, it can quickly elevate the heart rate to gain or maintain the heart rate in one’s “training range” (see note below). To add difficulty to the move, it can be done “on the toes” throughout the movement or end in a calf raise. More or less weight can be shifted to the chest and arms if one feels those body parts are being cheated and more shifted to the back later. One should always be conscious of involving the lower back in this movement, however, to help the back muscles remain strong and enduring in their own right! Combined with the “Squat Pull” or “Squat Row”, “Good Morning Dips” may be the only two exercises needed for a complete “Longstrength” or “Panaerobic” workout… but we’ll discuss more exercises soon! Note: Training range is determined by this formula : [220 – (# of years)] * (50%-80% depending on relative fitness). A very fit 40 year old might seek to maintain a heart rate of 144 during an extended training period. That is derived from the formula of (220-40)*80%. See your physician for guidance in exercising and determining a proper “training rate” or “training range” for your particular condition! 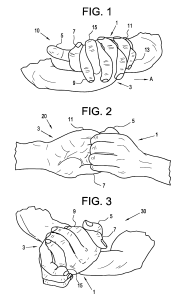 In Dr. Schwartz’ patent for “Strength Endurance Method” he describes what became his “Pan-X” exercise apparatus. While he has a separate patent for that device, he mentions it in order to describe his strength endurance method. He describes a number of exercises for his strength endurance method and one is a version of “jogging”. Why is it suitable for “longstrength”? Here is an interesting passage from the patent filing that relates both to “jogging” with Dr. Schwartz’ device and other exercises he envisioned using too. [The Pan-X device] used in “whole body” jogging movements in which the upper body is clearly a most active participant. “Press-ups” and “pull-ups” performed by the arms on the [cross bars of the device] add substantial upper torso work to these in-place ambulatory movements. Additional work may be included by lateral movements of the upper body (side-leans) and abduction/adduction movements of the thighs are options…. Thus, the goal of the method is to maximizethe “continuous strength” of a growing assessment of skeletal muscle groups, all within the framework of cardiovascular training. The measurable fitness levels achievable by this method cannot be duplicated by any combination of current conventional strategies, regardless of the complexity, size and overall expense of the equipment subserving those strategies. Further, those well trained by virtue of this method will find themselves able to enhance their performance at most conventional exercises and most forms of sport. 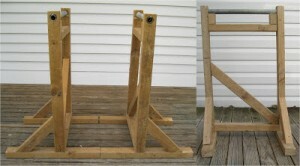 The nature of the additional strength made available by training with this method apparatus and its prescribed techniques is likely to be consistent with the development of “new” skeletal muscle mass which is structurally to be distinguished from that resulting from conventional strength training. It is believed that certain microscopic elements, i.e., intercellular capillaries and intracellular mitochondria will increase in number and density in skeletal muscles. In contrast, it is generally agreed that the distribution of such microscopic elements so crucial to continuous rhythmic work capacity are reduces or remain stable during prolonged conventional weight training. In terms of agility, this method is employed to fuse strength and endurance and also makes for enhanced motor skill consistent with our general definitions of agility. This unique “whole body” mobility continues to improve along with additions of strength and endurance. Dance-like movements, compound movements, shifts [in position on the device], and sprints represent a few of the categories of movement choices that both require and add to the quality of agility that can be gained uniquely from this exercise. In terms of pure strength, this method is apt to gain considerable strength and most of this will be of the continuous or “Longstrength” variety. This does not preclude training for a pure strength which can also be performed within the constraints of this method. Various pull-ups and press-ups during which the body’s weight is shared very little make for this option.Pure leg strength may be added in the form of one legged squats performed [with the device], first using a slight arm assist, gradually utilizing the leg musculature alone. Abdominal strength may be acquired by a number of movements in which the upper body segment is flexed against resistance,or during movements which require the lower body segment to flex upward while the feet are held off the floor, either while working [at various positions on the device]. Again, these strength movements can either represent the user’s total full strength training or be used as adjuncts to strength training of the conventional sort. In terms of flexibility, this method makes possible a unique approach to the acquisition and maintenance of flexibility. Given the support of the body at both [various positions on the device], whole body flexibility can be attained in either the “static” or “dynamic” mode. The hands can control the force which is applied to any of a large series of stretching movements that also eventuate in increased ranges of motion at the joints (an essential ingredient in most definitions of flexibility)…. Jogging while supporting oneself with the arms is a whole exercise, which happens to include something that remotely resembles what runners do when they call what they doing. But the hang time is different when compared with conventional running. 120 steps/minute can be achieved with the arms supporting the body. This is impossible during an unsupported jog. So Dr. Schwartz envisioned a mode of jogging or running that would end up training the whole body because the arms would be supporting the body during the exercise and be activated as they supported the running movement. Pressing up, pulling up, supporting the body’s weight, etc. would strengthen the arms and the “core” while the legs were being actively exercised and aerobic capacity developed. One of his main students John McKean never mentions this exercise. Dr. Schwartz himself sees it almost as a form of “active rest” in between more “tiring” exercises based on the above description. In any case, “whole body jogging” or even “dancing” is mentioned as one of the key elements in the development of “longstrength” and, if only for variety, practitioners may want to know how to do this exercise. While only three prototypes of Dr. Schwartz’ “Pan-X” apparatus were made, the exercise he describes can be mimicked with very good results on any suspension trainer suspended over even a small carpeted area and used in conjunction with “furniture sliders” compatible with carpet. Here’s a youtube video of the kind of exercise that could pass for “Jogging” for those interested in “Longstrength” instead of old fashioned “aerobics”. While you’re using the carpet sliders, remember to try Dr. Schwartz’ suggested “scissor movements”, side to side bending, and different ways of supporting your body while sliding, jogging or “dancing”. It may turn out to be a lot more taxing than the “active rest” Dr. Schwartz seemed to envision! Note: When he asserts that “intracellular mitochondria will increase” as a result of this exercise, he is laying a basis for the claims mentioned in Marty Gallagher’s discussion of “Third Way Cardio” in “Purposeful Primitive” that describe so-called “super hybrid muscle” that have not only endurance but a higher general level of strength as well. As Gallagher noted, other trainers spoke of this possibility and sought to achieve it through adaptations to traditional training, but Schwartz did so with a physician and researcher’s reserve and with his own unique methods (other methods tend to be based on more traditional weight training). In a previous post on Isotonometrics, the question was asked: “So was this “isometrics”? Or “dynamic tension”? Or something else? That will be explored in a future article!” This is that article. Dr. Schwartz’s extant writings interact from time to time with the systems advocated by other fitness experts who are mentioned by name, like Charles Atlas. He is always courteous but clear about how his viewpoint differs and what advantages he believes it to have. So how did Leonard Schwartz see his work in relationship to Charles Atlas’ “dynamic tension” and “isometrics’? The answer is found in his patent filing on “Fitness Method” with some observations drawn from the Charles Atlas course itself. …the concept of dynamic tension or isometrics is well known, having been popularized by Charles Atlas many years ago. The concept of isometrics involves pitting one or more muscle groups against other muscle groups in a stationary fashion. Typically, one hand of an exerciser is pushed against or pulled apart from the other hand with the other hand imparting an opposite and generally equal force. Neither hand nor the exerciser’s body is typically moved during the pushing or pulling of the hands. One of the drawbacks to the system of isometrics is the inability to generate sufficiently large workloads to involve the circulation (heart rate especially) appreciably. For one thing, the duration of each isometric exercise is too brief; for another the muscle mass involved in the exercise was generally too small. Consequently, isometric exercise only provides strength improvement and does not contribute to endurance, flexibility, aerobic training or the like. Technically, Charles Atlas’ “Dynamic Tension” and Dr. Schwartz’ “Isotonometrics” are not “isometric” because they are not static holds. Movement is involved in each. Schwartz is correct though in that most Dynamic Tension and Isometric exercises attempt to isolate relatively small muscle groups, though some isometric exercises like the Kiveloff protocol seek a simultaneous “whole body isometric”. The Charles Atlas course of exercises taught the development of the body’s various muscle groups by way of specialization and isolation. His exercises were varied. Some were “dynamic tension” with limb to limb resistance. Others were “isotonic” exercises… well known calisthenics like his pushup variation, deep knee bends, lunges and, even, running. In general, however, there was no emphasis on involving all the limbs or the majority of the body’s muscle groups at the same time. One exception to this is a modified “burpee” that is demonstrated by Atlas in Lesson 6, Exercise 2. From the squatting position, the legs are kicked back. It is not a commonly known burpee that usually starts and ends in the standing position and may include a pushup or many other variants. In general, however, Schwartz’ assessment of Atlas’ dynamic tension approach and isometrics in general was correct regarding the tendency toward isolating individual muscles and muscle groups. Dr. Schwartz’ method of “Isotonometrics” in contrast seeks to involve as much muscle simultaneously as possible (a common feature of all his exercise recommendations). To involve as much upper body muscle as possible, he advocates a form of “dynamic tension” with broad movements with as much range and muscle involvement as possible for the upper body while activating the lower body with trunk bends, twists, knee bending, stepping, and lunging. He also envisioned arm to leg resistance exercises and leg to leg resistance exercises as part of his system. Though Dr. Schwartz advocated innovation and flexibility in arm movements to avoid boredom, some of his “handclasps” and “handtrails” resemble the Atlas system. For example, in Lesson 1, Exercise 3, Mr. Atlas has an exercise that involves pulling on an imaginary rope from head to thigh. The motion of the downward hand activates the “latissiums dorsi” muscles among others which pull the arm down and backwards while the motion is resisted by the bottom hand which activates the biceps, frontal deltoid, and trapezius muscles which pull the arm upward. Obviously to exercise both sides of the body, the dominant hand must be changed half way through the chosen number of repetitions. The “rope pulling” movement and several others in the same lesson are perfectly in line Schwartz “Isotonometrics”… the difference, however, is that in Schwartz’ method they would likely be performed at lower tension to accommodate higher repetitions and in conjunction with lower body movements or even dance like movements. Schwartz’ Isotonometrics had several similarities to the Charles Atlas system while building on the results of modern understandings of training to produce cardiac and general muscular endurance. Both incorporated “dynamic tension” and “isotonic” (calisthenic) exercise though not technically “isometrics” in the form of the static holds studied, for instance, by the Max Planck Institute. Unlike Atlas, Schwartz consciously used predominantly upper body dynamic tension work to replace the use of hand weights for that purpose. Whether using weights or “dynamic tension”, the use of the upper body along with traditional lower limb cardio was to mimic the high oxygen processing of Nordic skiers while minimizing the stress and injury potential on any one body part. There is a enough similarity in outward exercise forms between the two systems that a number of upper and lower body exercises from the Atlas course could conceivably be combined to form “whole body” movements. If those cojoined exercises were performed with a tension that allowed the activation of muscles for long enough time to create an aerobic effect, the untrained eye could not really tell the difference between the Atlas dynamic tension and isotonic moves combined and adapted for endurance training and the Schwartz Isotonometric moves.